Built in 1968 by the U.S. Coast Guard at Curtis Bay Maryland as a high endurance rescue boat capable of operating in extreme weather: surf to 20 feet, 100 miles offshore, towing to 125 gross tons, winds to 50 knots and seas to 30 feet. These operating parameters have historically been safely exceeded; there is no other vessel in existence with the safety record of the MLB‘s, which are credited with thousands of successful rescues. With rescue now favoring helicopters, and the multi-mission needs of today's Coast Guard, perhaps a more seaworthy vessel will never again be built. 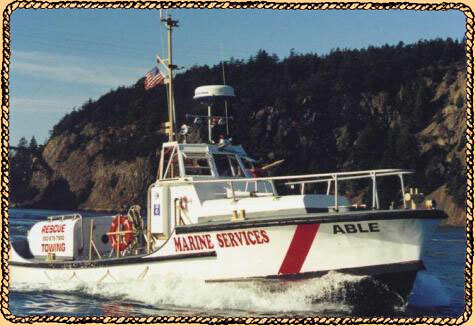 ABLE continues this mission as the flagship of MARINE SERVICES’ fleet of commercial assistance vessels providing Towing, Salvage, and "Vessel Assist" services. 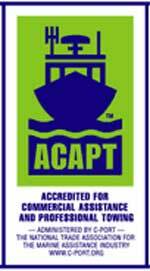 She has been outfitted at our Boatyard with modern electronics, specialized diving and salvage gear, first aid and rescue supplies, and a boatload of tools and rigging. Built as #44379, (#79 of 105), she cost $145,00 to buildin the sixties, Served at Tillamook Oregon and was then sent to the National Motor Lifeboat School at Cape Disappointment and where she served duty as a training vessel. We welcome any "SEA STORIES" of her past. 44' Motor Life Boat//TUG "ABLE"